When we're taught about Christopher Columbus in school, we hear the glorified version. We don't hear about how he probably wasn't even the first European to discover the Americas, how he actually thought that he'd landed in India because he believed the world was pear-shaped and much smaller than it actually is, and of course, his brutal treatment of native populations. 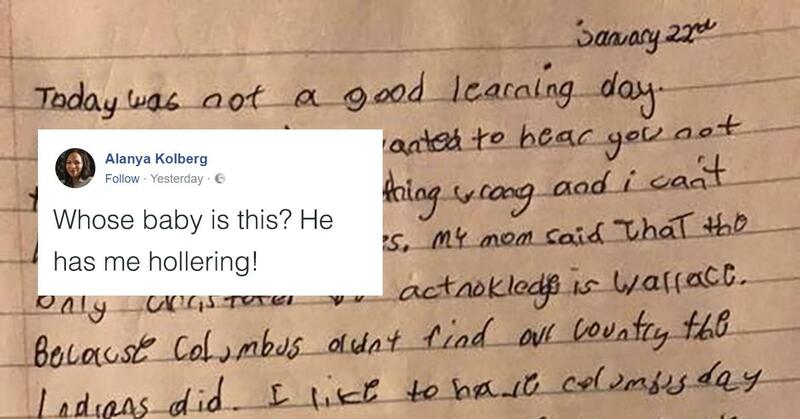 Alanya Kolberg recently took to Facebook to share a school journal entry by a Detroit school child named King. In the journal, King blasts his teacher for"teaching lies" about Columbus. "Today was not a good learning day. Blah blah blah I only wanted to hear you not talking." "You said something wrong and I can't listen when I hear lies. My mom said that the only Christopher we acknowledge is Wallace." "Because Columbus didn't find our country the Indians did. I like to have Columbus Day off but I want you to not teach me lies. That is all." "My question for the day is how can white people teach black history?" The teacher replied to the entry with: "King I am very disappointed in your journal today." To which King replied: "Ok."
Savage. Unsurprisingly, social media was all about the journal entry. Some user's pointed out King's use of the term Indian as opposed to Native American, though others were quick to point out that many adults still use the term. obviously it’s incorrect but still a common name even used by Natives themselves. Well, I mean... His teacher isn't teaching facts so he may not know that Native Americans is the correct "name". Others just loved the journal entry. King, I was a teacher before I became a social worker. I would NEVER use red pens or criticism in a student's journal. Great job standing up for what you believe is correct! I bet your Mom can help the teacher learn more about our country. Keep up the good work. 10/10 for King. Detention for the 'teacher'. Go King! Your teacher might someday open her heart to learning from you. i'm disappointed in the teacher. although the kid should've said 'indigenous peoples' instead of using 'indians', he was speaking the truth & it was a great moment for the teacher to respect him and engage in how she could do better instead of her basically trying to shame him. Get this kid a scholarship.